Filtrete High Performance Drinking Water System Filter, Single Stage PLUS. Filtrete High Performance Drinking Water System Maximum Filter reduces select VOCs (Herbicide Atrazine and the Pesticide Toxaphene), Lead, Select Pharmaceuticals, Cryptosporidium and Giardia Cysts, Chlorine Taste and Odor, Sediment, Rust, and Dirt. 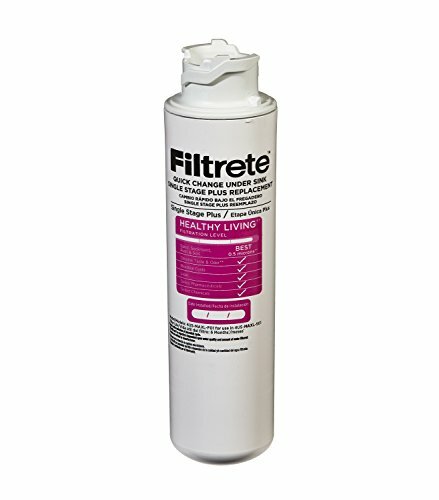 Filtrete Maximum PLUS Filters are easy to replace with a 1/4 turn change and last 6 months (750-Gallon). Enjoy maximum water filtration without taking up a lot of cabinet space.